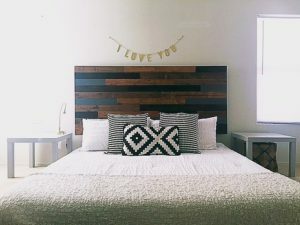 DIY Pallet Headboard – Follow these simple instructions to create a unique headboard from repurposed pallets. 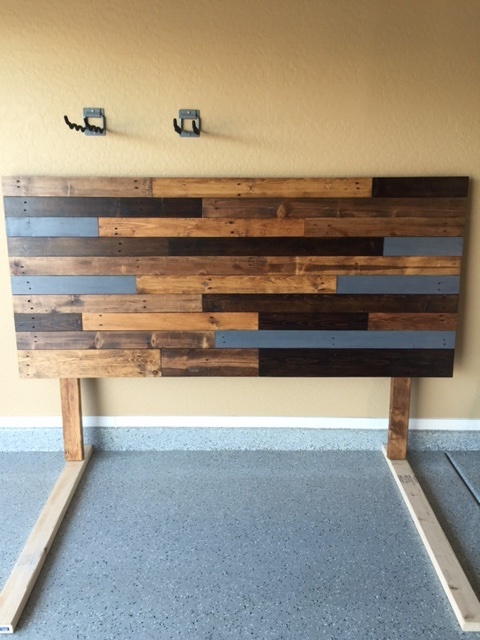 I made this headboard from pallets after a request from my Daughter. She had a specific design in mind and we worked out the details together. The headboard was very easy to make and the end result was great. 1. 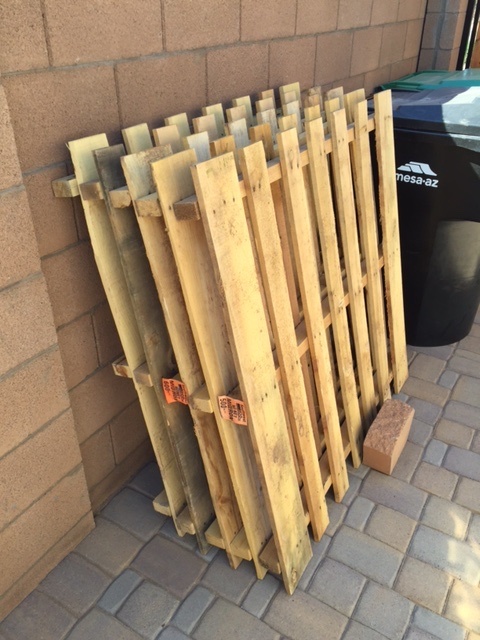 Find some used pallets in good condition. Many businesses have pallets that they will give you, or you can check on Craigslist or similar websites for folks selling or giving them away. Some things I looked for when selecting the pallets included; wood that was not rotted or cracked, fairly straight edges, and visual character attributes like knots and swirls in the grain. For the king bed sized backboard created here, I used a total of five pallets. 2. Take the pallets apart being careful not to crack or damage the wood slats. I used a pry bar and hammer, but a better method would be to use a reciprocating saw like the Ryobi Cordless Reciprocating Saw . Determine what size you want your headboard to be when finished. I made mine for a standard king size bed. The total width I decided on was 80 inches. The finished height will be determined by your own preference and the size of your bed frame. 4. 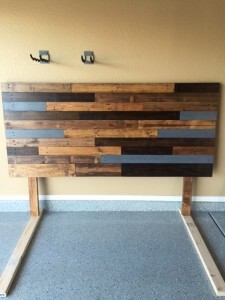 Create the headboard frame for the pallet slats. I used two 2 x 4’s for the legs and 1/2″ plywood sheet for the actual frame backing. 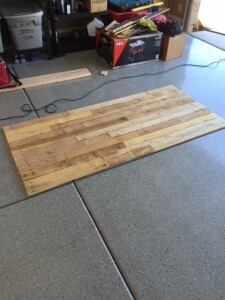 The plywood was cut to 78″ wide and 36″ high. The width of 78″ was to allow for a one inch overhang of the pallet slats on each side of the frame. The 36″ height was a personal preference. 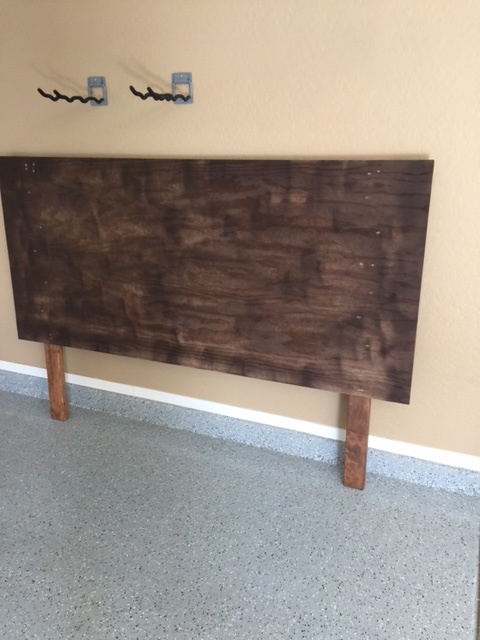 I used 1 and 5/8″ wood screws to attach the legs to the frame and spray painted the plywood a dark brown to hide the bright color of the plywood if any were to show through the slats. NOTE: The total height of the headboard, with the 2″ x 4″ legs added was 54″. Again, this was personal preference as the headboard was being built for a bed that rested on the floor and not on a typical bed frame. I placed the legs 6″ in from the ends, however, if you are mounting to studs you might want to reposition these to line up. 5. Cut your pallet slats to fit the width of your headboard. I drew mine out on paper first to make it easier to determine slat lengths. The idea is to stagger the joints so they do not overlap, which helps create a nice looking pattern. Make sure the slats are the same width for the entire row or you may run into problems such as large gaps and a finished product with uneven top or bottom edges. I also tried to keep as many of the original nail holes as possible in the design to give the headboard a more rustic look when finished. 6. Lay the cut pallet slats out and double check your measurements to be sure your overall height and weight is still good. This will also help determine if there are any pallet slats that you might want to replace for aesthetic reasons. Make any changes or adjustments at this time. 7. Sand the cut pallet slats down to your desired finished texture. I wanted my slats to be fairly smooth and not so rough looking. 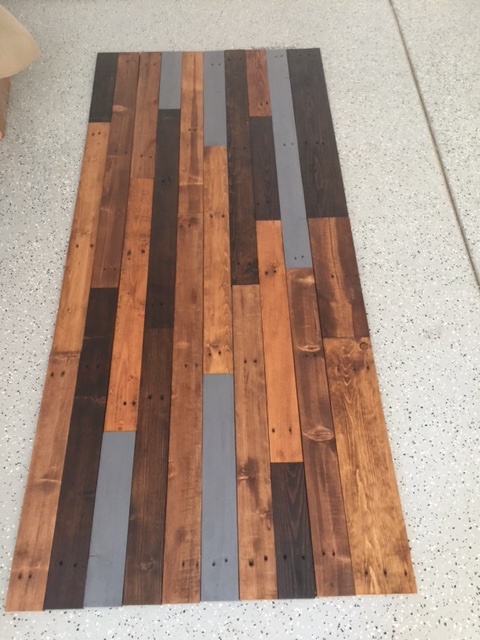 To achieve this look, I used a belt sander with 80 grit for the first pass. This got rid of a quite a bit of the splintery old exterior wood and left a fairly smooth surface. The grain also really started to pop and became much more visible. I finished up with one last pass with 120 grit and hand sanded the edges and ends with the same. 8. To obtain a more rustic finish you can add some distress marks to the slats. Some ideas to achieve this include; laying a large screw side ways across the slats in random places and striking it hard enough to leave an impression, adding some hammer mark dings, using the belt sander to make uneven areas along the slats. These will really stand out if you decide to add a wood stain to your headboard in the instructions below. 9. The next step is to stain the sanded pallet slats. I was making this headboard for my daughter and she wanted the finished product to have several different colors interspersed. Her color selection after viewing numerous samples included the following Minwax stain products; Special Walnut , Dark Walnut , Early American , and Classic Gray . 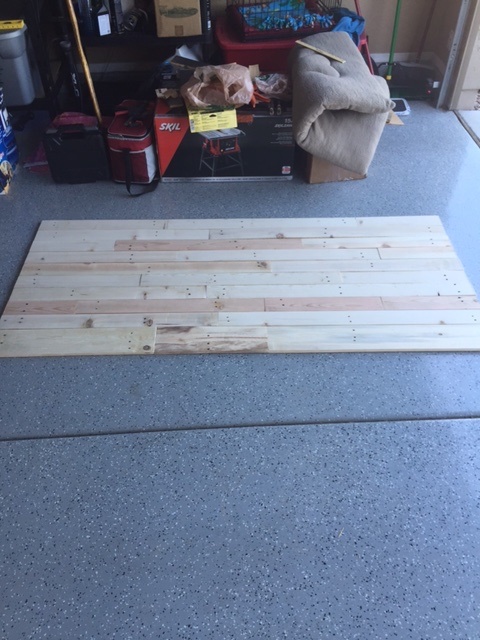 I applied the stains in a basically random method, although I used my layout of the slats on the floor to try to ensure I didn’t place too many slats with the same color right next to each other. 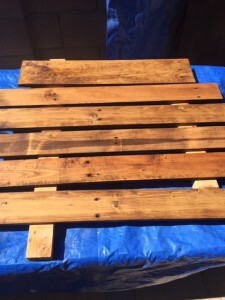 Once the stained slats dry you can further distress them by using sandpaper. I chose not to do this but if you are trying to achieve the worn and weathered look it might be a good idea. 11. Attach the pallet slats to the headboard frame you created earlier. Remember to account for the overlap on the ends if you planned it that way like I did. It is also a good idea to lay each row out before you attach it to the frame to avoid any possible mistakes. 12. I started at the top left side of the frame and worked my way down row by row. I used Liquid Nails Project Adhesive to glue each piece to the plywood frame, along with 1″ brad nails (minimum of four per slat and more for longer slats) installed with my PORTER-CABLE Brad Nailer . After each row you should check your measurements to make sure the lines are fairly straight. You can make adjustments as you go. Small gaps are highly likely because, after all, you are working with old pallets. These give the finished product some character and, in my opinion, are visually appealing. 13. 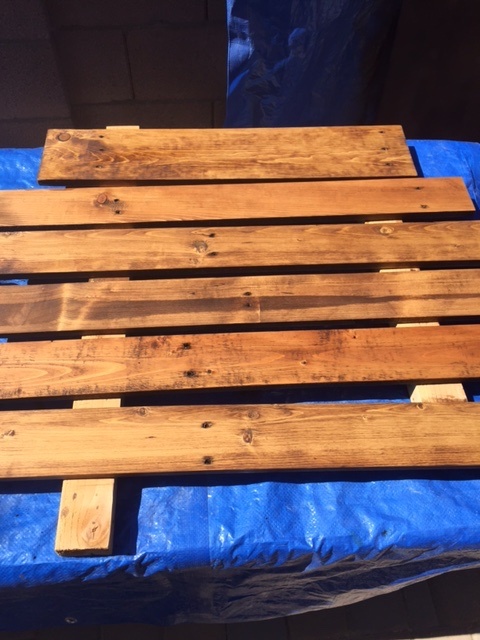 To finish the pallet headboard, I stained the 2″ x 4″ frame legs with the Minwax Early American . I then applied three coats of Minwax Polycrylic Satin Finish to the entire headboard to smooth out and protect the final product. Without the Polycrylic the headboard was very rough feeling and any splintering revealed unstained wood beneath the damaged slat. The Polycrylic also gave the headboard a nice dull sheen and makes cleaning and upkeep much easier. 14. And that’s how to make a headboard out of repurposed pallet wood!